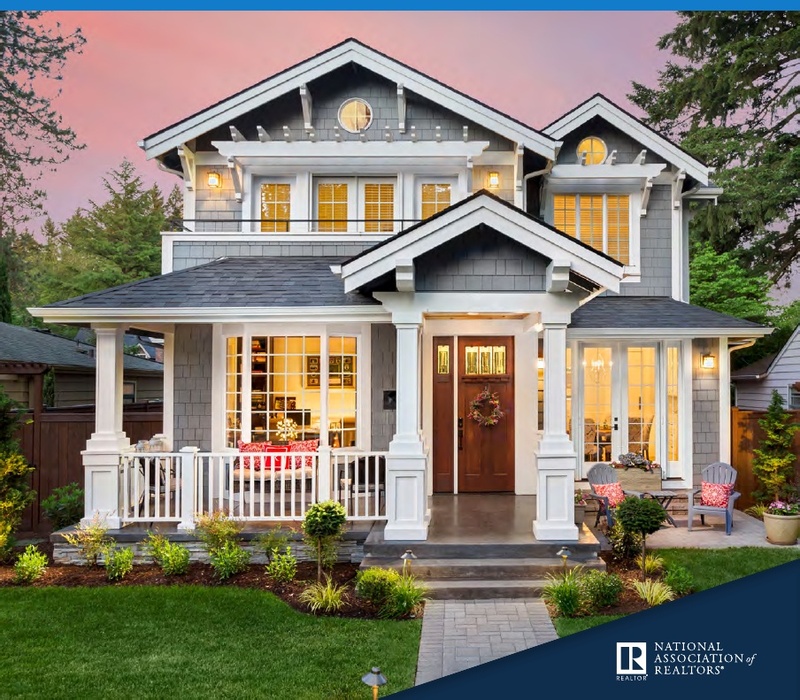 WASHINGTON—Single female buyers continue to be a powerful force in the market, while low inventory, rising interest rates and increasing home prices are holding back first-time buyers despite notable interest in buying a home. These factoids were part of the National Association of Realtors’ 2018 Profile of Home Buyers and Sellers report released on Oct. 29. The 150-page report also identifies numerous current consumer and housing trends, including mounting student debt balances; the impact of pets on home buying decisions; increases in down payments for all buyers; the rising age of repeat buyers and the fact that a vast number of respondents use a real estate agent to buy or sell a home, which kept for-sale-by-owner transactions at an all-time low. For the second year in a row, single female buyers accounted for 18% of all buyers. The group was the second most common household buyer type behind married couples (63%). Single male buyers came in third and accounted for half the number of buyers as their female counterparts (9%). However, single males tended to purchase more expensive homes, with a median price of $215,000, compared to single females with a median price of $189,000 (the lowest of all household buyer types). The share of first-time home buyers continued a three-year decline, falling 33% (34% last year). This number has not been 40% or higher since the first-time home buyers credit ended in 2010. For the third year in a row, 95% of buyers used the Internet at some point during their home search process, and 50% said that they found the home they eventually purchased online. A total of 86% of buyers used a real estate agent in their home search, and repeat buyers were more likely to use an agent than first-timers (87% to 86%). Overall, 87% of buyers ended up purchasing their home through a real estate agent (the same as 2017), as finding the right home and negotiating terms of sale were the top factors buyers desired from their agent. Ninety percent of respondents said they would definitely or probably use their agent again or recommend them to someone else. Once again, student loan debt stands out as a challenge keeping would-be buyers out of the market. Among the 13% of buyers who said saving for a down payment was the most difficult part of the buying process, 50% reported that student loan debt had inhibited their ability to save for a home purchase or down payment. Twenty-four percent of all buyers indicated they have student loan debt, at a median of $28,000, and 40% of first-time buyers indicated that they have student loan debt at a median of $30,000. Overall, buyers paid a median 13% down payment, up from 10% last year and the highest since 2005. 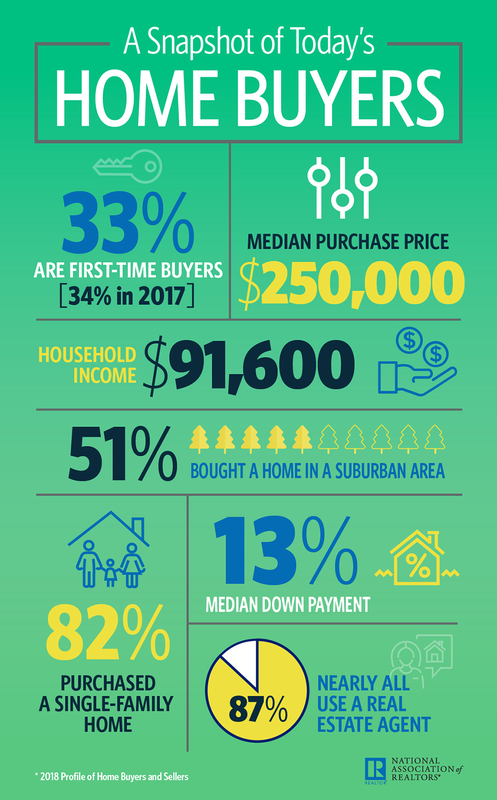 First-time buyers paid a median 7% down payment, up from 5% last year and the highest since 1997 (9%), while repeat buyers paid a median 16%, up from last year’s 14% and the highest since 2010. A majority of buyers ranked their personal savings as the primary source of their down payment (58%). Repeat buyers were most likely to use the proceeds from the sale of the previous primary residence (56%), while first-time buyers were the most likely to use a gift from a friend or relative (24%). A majority of buyers continue to choose a detached, single-family home (82%) as opposed to a townhouse or row house (8%) or a condo/duplex/apartment unit (4%). For the third straight year, the median age of first-time home buyers was 32 years old. A majority of first-time buyers were married couples (54%), followed by single females (18%). Their median income was the same as last year’s at $75,000, and they spent a median of $203,700 on a home. These buyers were more likely to purchase smaller homes than repeat buyers, with a median size of 1,600 square feet. The age of repeat buyers increased to an all-time high of 55 years old (up from 54 last year). A majority of repeat buyers were also married couples (57%), followed by single females (18%). Their median income increased from $97,500 last year to $100,000 and they spent a median of $280,000 on a home. The median home size remained the same as last year, at 2,000 square feet. Fifteen percent of all buyers said that convenience to vets and/or outdoor space for their pet was a critical factor in determining where they wanted to purchase their home. That number rises to 20%, or one-fifth of buyers, for unmarried couples. For-Sale-By-Owner sales accounted for 7% of all sales—the lowest number recorded in this survey’s history. This number has been steadily declining since a high of 15% in 1981, with more and more owners relying on the expertise of an agent to help navigate the complicated process and intricacies of a home sale. NAR mailed a 129-question survey in July 2018 using a random sample weighted to be representative of sales on a geographic basis to 155,250 recent home buyers. Respondents had the option to fill out the survey via hard copy or online; the online survey was available in English and Spanish. A total of 7,191 responses were received from primary residence buyers. After accounting for undeliverable questionnaires, the survey had an adjusted response rate of 4.6%. The sample at the 95% confidence level has a confidence interval of plus-or-minus 1.15%.